Amma giving satsang in Bonn where the crowd grew so large that Amma invited many people to come and sit alongside Her on the stage. Amma’s devotees welcome Her as she enters the hall in London. On the ninth day of Navaratri, a special program was held at Amritapuri for those devotees who are members of an Amrita Kutambam. An Amrita Kutambam is a formal group of ten families which meets regularly for satsang and service activities. Over 1000 devotees attended. The program, led by Br. Sivamrita Chaitanya, included satsang, archana, bhajans, and a Sarvaishvarya Puja. 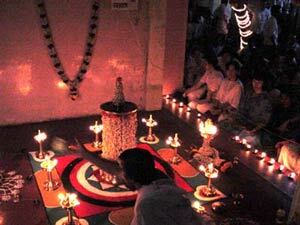 The Sarvaishvarya Puja is a special puja for gaining spiritual and material prosperity. Also on that day, a special homa was also performed for world peace. The following day, on Vijaya Dashami, Swami Amritagitananda led a chant of the Saraswati mantra while all those who had left their books and instruments at the altar on the eighth night came to retrieve them. After-wards he led bhajans while Swami Turiyamritananda formally initiated over forty local young boys and girls into learning. In a traditional Vidyarambham ceremony, Swami Turiyamritananda helped each child to trace the letters of the Sanskrit alphabet in a plate of rice. Amma’s programmes in Munich were well-attended by both long time devotees and those just discovering the bliss of being in Amma’s presence for the first time. One can only guess at why tears come to one person’s eyes, while another breaks into a broad smile. One only knows that around Amma, there is always an outpouring of tears, laughter, song, and silence. After the last minute changes to Amma’s tour schedule, it was feared that the latest news would not have reached everyone in time and that the programmes there would be smaller than usual. But as you can see from these photographs depicting the Atma Puja which Amma conducted in Zurich just before the first Devi Bhava of Her European Tour, the spacious auditorium was filled with devotees, no doubt happy to be once again in the lap of the Divine Mother. The soft light of pre-dawn, the calls of tropical birds waking to a new day, and otherwise silence. There is, in this stillness, a big crowd at the foot of Amma’s steps, because no one is sure just when She will leave for the airport, and everyone wants a last glimpse, perhaps a word or a touch. Eyes are turned upwards, to Her window, where a light burns, and we feel it as a sign of Her presence. The sun rises, the palm trees are no longer black silhouettes against a silver sky, but a strong deep green against brilliant blue. There is a flurry as the people who have stood so still and quiet, forming two orderly rows along the path Amma will take from the steps to Her waiting car, hear the door above opening and know She approaches — joy, on seeing Her; dread, for now She really is leaving. And so on this Wednesday morning, in early October, Mother was leaving behind this particular group of Her children to be among the children in Europe and America. Unhesitating, She plunges into the sea of Her waiting children, stretching Her Hands as far as She can, touching everyone possible. She goes slowly, slowly, towards the car, taking time to question this daughter, give some orders to that one, laugh with this group, call out to those sons on the far side of the car. She reaches the open car door, and generously does not get in right away. She stands a bit longer, slowly sweeping all directions with Her gaze. She lifts Her eyes upwards, seeing the sons standing on the brahmacharis’ balconies to the south; She turns east, and follows the sweep of the temple’s spiral staircase all the way to the top, for every step holds a son or daughter, or two! Her gaze moves higher: in the sky, birds have gathered. It looks like the sky above a new Brahmasthanam temple, where without fail while Amma is performing the pratishta birds swoop in great circles. She has said the real pratishta (breathing of life into an image of God) must occur in our hearts, not just in statues of stone. Our hearts are overflowing, and so is Hers. “Namah Shivaya, Makkale!” Amma calls out, raising Her hands in a salute above Her head. “Om Parashaktyai!” calls a tremulous voice. Mother bends to take Her place in the car; someone shuts the door. Never mind — her window is immediately open, and Her Hands are reaching out for the touches of Her children. The car begins to inch forward, and the people clustered in front move to the sides. Long rows of ashramites have formed a “road” for Amma’s car: eastward behind the temple, around the East Wing, north between the temple and the new construction (where the kitchen used to be), through the front gate, towards the flats, and west towards the sea. we stand straight, looking towards the approaching car; as it nears, we lean, and when it is abreast of us, we bend down to look inside and see our Mother, and our hands reach out to touch if not Her Hand then Her window. The car moves past and we straighten and turn, watching till there is nothing, no One, to see. It is a slow dance of leave-taking. Just before the gate to the beach road stands Ram, the getting-bigger baby elephant. Every night after bhajans he gets a ten or fifteen minute playtime with Amma; he, too, will miss Her. Her car stops and a brahmachari is there with a big tray of bananas and biscuits. Ram knows the drill: he steps right up to the open car window, and Amma stretches out Her hand, offering him a good mouthful (that means a couple of bananas in one gulp). Now he backs away to turn in a big circle: his special trick. Back to the car window for more treats. While Amma caresses his trunk, She sees the people crowding too close for safety and calls out a warning. Our ever-alert, protective Mother. With a kiss on the thick rough hide of the long grey trunk, She bids Ram farewell, and allows Her car to move the last few metres to the boundary of the ashram. While a good contingent of white-dressed ashramites runs along beside and behind Her car, now it is the colourful dhotis and saris of the villagers that line the route. Amma’s car makes its way south along the beach road. On the left, the multistoried flats, the temple and the hospital; on the right, simple concrete houses and thatch huts, palm trees, the `wide, white-sand beach, and the Arabian Sea. Ahead, the children of Europe and America. Behind, the ashram children. All waiting. When you see thousands of people gathered in the auditorium south of the temple, and the stage filled with visiting dignitaries; when you see the brilliant orange and yellow robes of Amma’s monastics clustered behind and to Her right, and when you see seated just behind and to Her left the mother and father who raised Her; when you can barely see Her face because so many flower garlands almost hide it, and when Her feet are not to be seen at all because of the mountain of lotus petals covering them, you must not stop there. Look deeper. Look through a small opening in the mantle of garlands. See Her hands, absolutely still, held near Her heart as they have been throughout the ceremonies. They are the hands of humility and service, patiently waiting while Her children perform the rituals that celebrate Her birthday. Amma indulges Her children’s desires to have a birthday celebration on a grand scale; but there is for all of us the attendant risk that we will be swept away by the pageantry and forget that all of that is not really what Mother is about. But She doesn’t forget. No matter how many people have come to see Her, how many dignitaries have come to honour Her, how many swamis and swaminis and family members attend upon Her, nor how many garlands and lotus petals adorn Her, She is always the same: the humble, simple servant of all who need the ministrations of the Universal Mother. Watch Her carefully, and you will see that She is not changed by all this attention; She never loses Her central focus; She never fails in humility. The conch is sounding. In the massive crowd everyone is craning to look towards the back of the hall. Police are restraining those whose enthusiasm propels them towards the pathway strewn with flowers, brilliant yellow and red petals that make a solid carpet the full length of the central aisle. First around the corner comes a brahmachari with a big brass gong; its stately tones announce Mother’s arrival. But where is She? We see Her umbrella, held high by a brahmacharini – but where is She? She should be processing majestically down the center of this beautifully prepared path. Where is She? She is picking Her way as carefully as She can along the outer edge of the walkway, almost pressed up against the crowd-restraining ropes. What is this?! This is the same Amma we see daily, loving all life. Have you ever watched what happens when She comes down from Her room, and some loving devotee has made a small design of flower petals on Her bottom step? She will never tread on the petals; She will carefully step around or over them, but never bruise them. But as She moves forward in the hall now, She is really not free to avoid stepping on flowers; the procession cannot reach the stage if She does not compromise. She bows to the situation and blesses the petals with Her reluctant tread. Alongside, arms are stretching out expressing hearts yearning to touch Her. She raises Her Hands above Her head in a salute that means not what it does in the West (“I am victorious!”) but rather “I greet God in you.” Before She reaches the ramp that leads from the floor level up to the stage, She has removed the many garlands that had been offered to Her when She first came down from Her room; She mounts to the stage unadorned, a small woman in a simple white sari. She reaches the stage. There is the chair, front and center, draped majestically with a silk sari. She turns towards the crowd, arms again raised high, palms joined to greet the Divinity in all Her children. Then does She sit? Not yet. She kneels, places Her Hands on the carpet before Her, and bends until Her forehead touches the floor. She holds this humble prostration for a brief moment, and lifts Her Head. Then again lowers Her Head, a second, slightly longer prostration. Thousands of people are gathered to honour Her, and She bows down to them. This is the real Amma. She turns toward the chair, waits a moment so that a velvet footstool decked with lotuses can be removed, and, carefully avoiding crushing the remaining flowers at Her Feet, She sits. According to custom, She is immediately welcomed with a garland; according to Her own simple humility, She removes this garland. She is a white place of radiance at the heart of a panoply of brilliant colours, and She sits very still, very modest, regal in Her humility. Swami Amritaswarupananda prostrates and sits beside Her, ready to perform the pada puja. Swamini Krishnamrita Prana is on the other side, ready to assist. Certain preparations are underway: a pillow is moved, the tray is put into position, Her Feet are raised and placed in the tray…most of this occurs without apparent engagement on Her part; it is almost as if She has turned Her body over to those who will do the ritual. But don’t think She is unaware: in all the movement, Her foot touches something or someone (we can’t see what), and She immediately bends to touch the “victim” with Her hand, which then She touches to Her forehead and heart. This is a familiar gesture; it means, approximately, “Excuse me; I didn’t mean to be disrespectful.” She may be oblivious to all the fanfare, but She does not overlook her “offence”, how ever unintentional it was. This awareness and humility is the real Amma. Now begins Her stillness. With no flourish, She becomes composed, Her hands forming a mudra (symbolic gesture) in Her lap, Her eyes softly closed. At six minutes before nine in the morning, the ritual washing of the Guru’s feet begins. Children from the orphanage in Parippally are playing traditional temple music, swamis are chanting, and all eyes are fixed on the small, motionless figure in white, a mysterious blend of absence and Presence. After the ablutions, the deep tray with its scalloped edges is removed and a simple silver one is put in its place. Mother has remained immobile. Having carefully dried Amma’s Feet, Swamiji gently applies the light brown sandal paste and red kumkum, and centres on Her feet a single perfect lotus in full bloom. He adds another lotus to the left of the first, and a third to the right. Amma has still not moved. Standing, he carefully places a garland longer than Mother is tall around Her neck, draping it down along Her lap, to the floor, where it encircles the plate and Feet. He places a second garland over the first; this one ends before the floor. In a movement so subtle it was missed, Her Hands have slipped into a slightly different mudra now; still they rest peacefully, Her eyes remain closed, Her body is unmoving: composure at the heart of fanfare. If you are able to look closely, you will see those small and graceful hands, thumbs and forefingers touching, remaining unmoved there behind the flower garlands while Swamiji chants the Divine Names and thousands of voices respond, “Om Amriteshwaryai Namah” . You will see the pink and white lotus petals that Swamiji is offering as he chants; they are falling softly at Mother’s feet. Your eyes will move to Her impassive face. Are the eyelids trembling with the effort to remain closed? Not at all. You see only utter stillness. Where is She? She does not move when the camphor lamp is circled before Her; She does not stir when Her elder monastic children garland Her and prostrate, nor when Her parents add their garlands. Her brown face is tiny in a riot of pink and cream and white flowers, and still She doesn’t move when Swamini Krishnamrita has to lift off some flower malas to make space for more. But She isn’t really elsewhere, for when the visitors among those fortunate enough to garland Her on this day come forward, She seems to feel the presence of guests, and graciously stirs to greet them: to this one, a quick glance; to the next, a smile; now She herself removes malas to make place for the next ones. She bends down to the mountain of lotus petals burying Her feet, takes a handful, showers them on those who approach. She is “back with us,” but not so much to accept gifts as to give them. This is how Amma is. The garlanding goes on for some time: there are family members, staff members from AIMS, visiting monastics, representatives of the political world, custodians of our culture, women and men from so many walks of life! And there is someone who, in bowing, loses his glasses; they fall into the pile of flowers at Her Feet. She sees, and with no thought whatsoever for Her own dignity, She bends over, picks them up, touches them respectfully to Her forehead, and, smiling, hands them to him. This is how Amma is. Just before nine-twenty, the garlanding ends. The sari-covered chair has served its purpose, and Mother will return to Her more usual seat: a low platform (peetham). She is ready to stand, but first bends down to clear the space at Her Feet: She raises the edge of the cloth there; this lifts the flowers out of the way. We know why. Now She will talk, She will lead bhajans, She will greet and be greeted by visiting dignitaries, listen to their speeches, give them special awards – do all the formalities scheduled for this special day’s festivities. This is a long program, from before nine in the morning until past noon – all the heat and noise and sweat and confusion will have readied most people for a much-needed break: lunch and a rest. But at the end of the last event on the special program, Mother will not take a break at all. No lunch and no rest. She will stand so that Her peetham can be moved closer to the edge of the stage, and She will begin to hug all those thousands who have come to share Her birthday. To widows who receive monthly pensions from Her special program, She will give a birthday present: a new sari. To the anxious She will give advice and encouragement; to the grieving She will give solace; for a school child She will hold and bless a set of pencils; with a woman who just received a promotion, She will celebrate, and with a father whose children have returned from abroad She’ll rejoice. These are the gifts the Divine Mother gives Her children on Her birthday. Six in the evening. Mother has been on stage since before nine. Can’t She go rest now? She stands, and from every direction you hear “Amma Amma Amma!”. Look at Her right shoulder — was that dress ever white? It is dark with traces from all the faces that She has pulled close this day. She bends in a quick, small bow, and steps down from the stage. The children from the Parippally orphanage are grouped close to the aisle and She stops to laugh with them, and to stretch Her arms out as far over the railing as She can so that as many orphans as possible can touch their Mother. She moves along the aisle now, and people are still calling out to Her and stretching their hands towards Her. The brahmacharinis near Her try to intervene, knowing that in the fervour of the moment a devotee might grab Her Hand and forget to let go, or touch Her Face and unintentionally scratch Her. It is the attendants’ job to protect Mother’s body, but She is not co-operating: She scolds them, shoos them away, and makes Her way close to the rail to comfort a distressed daughter. Does She get pulled or scratched or wrenched in these last moments before going to Her room? She does. But the expression of Her love and compassion for Her children is not to be limited by concerns for Herself. This, too, is our Amma. Shortly after six, Mother reaches Her room. Who wouldn’t be ready to collapse now: have a leisurely bath, a slow, nourishing meal, and a good long sleep? Mother. In less than two hours, She will come back out. For Devi Bhava. But it isn’t Sunday! Never mind. It is Amma’s practice to give Her children the gift of Devi Bhava on Her Birthday, so She will do that. Over twenty-two thousand tokens have already been given out. It will be a long night. It was a long night. Bhajans, then Devi Bhava. Mother in white and gold, as always on Her Birthday. At Her fastest speed – such as is necessitated in Calicut, famous for immense crowds – Amma can give nearly two thousand hugs in an hour. It is a gruelling pace, but She can manage it, and Her children wait for hours for their swift embraces: such is their faith and confidence and love. So on this night, if Mother maintains Her top speed, it is possible that the darshan that begins by 9:15 p.m. will end a bit under twelve hours later, before nine in the morning. Of course, it doesn’t. She can’t resist taking the extra time needed to listen to a destitute man’s story of his losses, or to rejoice with a young couple who bring their new daughter for Her blessing. So darshan is still going strong at nine. And at ten. At ten-fifteen, She stands; it is finished at last. No, it isn’t. More people come pouring in from both sides, and She sits again, hugs and whispers, consoles, listens, laughs…pours out Herself. The line ends. She stands. Sits again. More people have come running. She does not turn them away. At last, She stands. Her sari is adjusted, Her crown is straightened, She will step to the edge of the stage now – no, wait: another darshan! Amma, standing, embraces once again. Devi moves to the edge of the stage and showers Her children with flower petals. It is a beautiful reversal, for ordinarily it is the devotee who offers petals to the deity. But what else, what else but a reminder of the Divinity in All would we expect from our Amma, embodiment of perfect Love and Humility? Shortly before eleven on the sunny morning of the day after Her birthday, Mother climbs the steps to Her room. She pauses there, once again in Her plain white sari, completely natural and simple even though She has just accomplished another marathon. In plain clay pots at the top of the stairs live not impressive grand lotuses but ordinary little blossoming ramblers. Their small flowers make the perfect setting for the smile of this humble servant and Mother of the World. *Mudras are formal positions of the hands, with associated spiritual meanings. According to the Hindu calendar, Amma was born in the month of Kanni under the Kartika star. This year, this day fell on the 6th October. 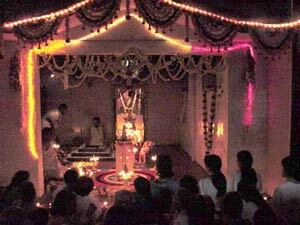 That evening, while Amma gave darshan in the auditorium, the Kartika puja was held in the Kalari as it is every month under the Kartika star. Devotees crowd around the opening to the Kalari. If you look closely in the picture below, you can see the entrance to the tiny room where Amma’s Bhava darshan used to be held in olden days. After watching several cultural programmes including a performance by renowned danseuse Kumari Kavya Madhavan, Amma left the stage and began walking toward Her room. A few of the ashram residents ran to Her steps, hoping for a glance or a smile as She walked by, but no sooner had She rounded the corner into Her courtyard than She turned on Her heel and made a beeline for the kitchen. Once inside, She visited all the devotees who were there doing late-night seva which was necessary to feed tens of thousands of mouths the following morning. In each area of the kitchen, the midnight helpers were engaged in a different task, and in each place Amma spent some time working with them, laughing with them, and all around lifting their spirits into bliss. For these children, to have an opportunity to serve Amma was enough; they could never have imagined that She might come to join them. For those few lucky ones working in the kitchen this evening, whether chopping vegetables or rolling chapatis or grating coconuts, it would be a night to remember forever. The festival atmosphere at Amritapuri stretched from Wednesday to Sunday morning, when Devi Bhava, begun the previous night at 8:00 pm, finished close to 11:00 am. In the days preceding Amma’s Birthday, the Ashram was transformed into a city of light. Local devotees teamed up to build several impressive structures, both decorative and functional as necessary shelters, while other devotees worked around the clock to prepare food for the 100,000 visitors expected from all over India. Still others worked tirelessly throughout to help the crowds move smoothly and efficiently. Wherever Amma walked, great care and artistry had been exercised in beautifying the path which lay before Her. Pictured at left is a scene from Her courtyard, where local devotees had lovingly lit Her way. While Amma would never take anything for Herself. She does make use of every opportunity to give to others in so many ways. This was even more evident on Her birthday. As she gave a laddu to each of the sixty thousand devotees who came for Her darshan that day, these are some of the other ways in which She was taking this opportunity to serve the poor and needy. On the Amma Birthday event, it has become a tradition to feed everyone who comes a delicious free meal. This year the meal consisted of rice, two kinds of curry, mango pickle, and as much payasam (rice pudding) as you could eat. 65,000 people were served free of charge. This year, the event was also an Amrita Nidhi Pension Payment Day. Every three months thousands of impoverished women (mostly widows) come to Amritapuri to collect the monthly pensions they receive from M.A. M, while still others come to apply. Currently the Amrita Nidhi project distributes more than 25,000 pensions to impoverished women throughout India, with a goal of reaching 50,000 women. 1,000 women were also given free saris (The nice clothing you can see many of the devotees wearing is often borrowed from a wealthier neighbor, as they want to look their best when seeing Amma).